by Mario Cala DPM1, Kristina Barreiro DPM1, Hany Jeffry DPM1. Bilateral fractures of the talus can be considered extremely rare. The appropriate treatment suggested by most experts includes permanent anatomical reduction with fixation. Open surgical approaches to the hindfoot can be associated with major complications. Some of these complications include vascular damage, soft tissue and surgical wound-healing problems due to the poor blood supply to the posterior ankle region. To avoid these complications, fluoroscopy assisted closed reduction and percutaneous fixation has been recommended in the treatment of less displaced fractures in some of the literature. This is a case report in which bilateral talar fractures were treated percutaneously resulting in early mobilization. The talus is a very important bone in the lower extremity. The body of the talus is divided into five surfaces: superior, medial, lateral, posterior, and inferior. The anterior surface is attached to the neck. The neck of the talus has four surfaces: superior, medial, lateral, and inferior. The head of the talus is entirely articular, consisting of three articular surfaces; the largest being the talonavicular articulation . It is highly vascularized with three main arteries supplying its blood supply. The anterior tibial artery, posterior tibial artery, and peroneal artery all give branches that supply the talus. Due to its high vascularity, the talus has a high healing rate, if vascularity is not compromised. 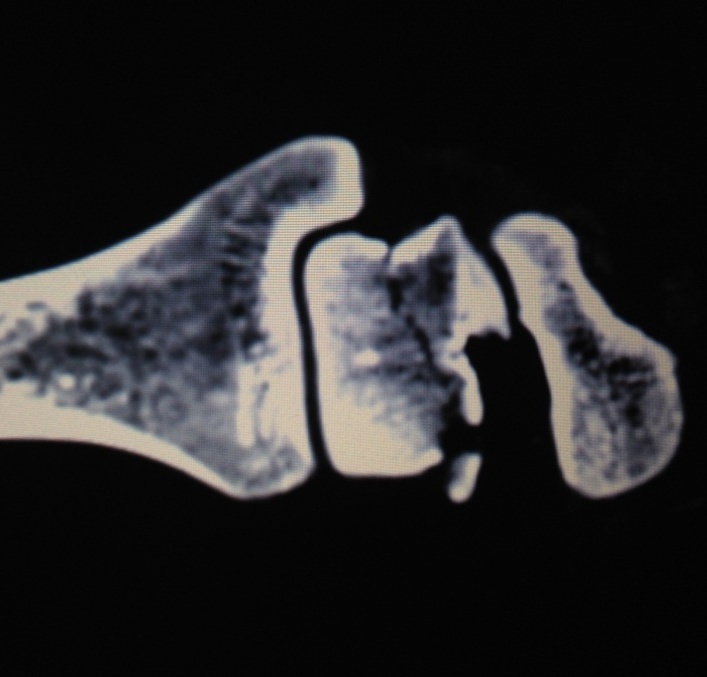 A positive Hawkins sign is seen in talar fractures 4-8 weeks after the injury at the subcortical bone of the talar dome due to the washing out of the subchondral bone and subsequent osteopenia. This indicates bone remodeling. It is highly predictive of a revitalization of the talar body after a fracture . Talar fractures can vary in site of fracture: from an osteochondral talar dome fracture to a dislocated talar neck fracture to talar body fracture. Each type of fracture has its own outcome in terms of treatment plan due to its mechanism of injury. The mechanism of injury for talar body fractures typically involves hyperdorsiflexion of the foot with impingement of the talar neck against the anterior edge of the tibial plafond . Another mechanism of injury resulting in fracture of the body of the talus is a fall from height, in which an axial compression of the talus between the tibial plafond and the calcaneus results. 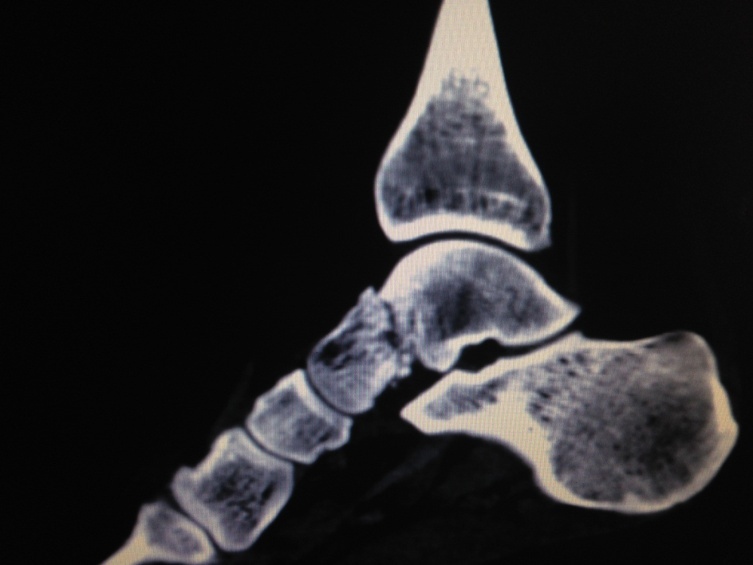 Fractures of the talar body, while uncommon, present a harsh prognosis due to its greater risk for avascular necrosis than talar neck fractures . 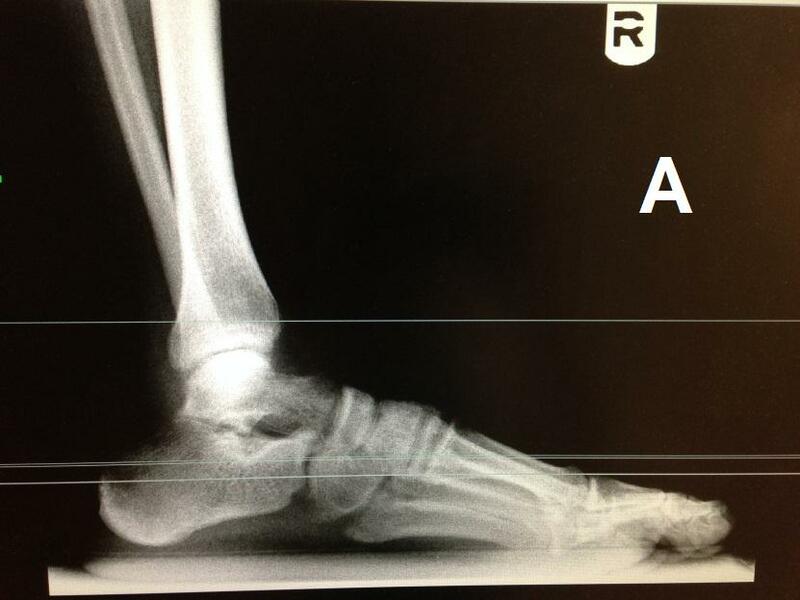 Talar dome fractures are caused by two mechanisms of injury: medial lesions were caused by inversion and plantar flexion of the foot with external rotation of the tibia on the talus, while lateral lesions were caused by inversion and dorsiflexion of the foot with internal rotation of the tibia on the talus. Talar neck and head fractures are more common than talar body fractures . Bilateral fractures of the talus can be considered extremely rare. The appropriate treatment suggested by most experts includes permanent anatomical reduction with fixation . One study found a patient with a left talar neck fracture of the lateral process and right talar body fractures with bilateral subtalar and talonavicular dislocations. Treatment was bilateral internal fixation. This case resulted in permanent pain and limitation in movement . The use of plain films and magnetic resonance imaging can help in the diagnosis and staging of these lesions as well as aid in treatment planning. Conservative treatment for nondisplaced talar fractures is common, but displaced fractures require stable fixation and early physical therapy . Classical treatment for talar fractures is open reduction and internal fixation. In the past, crossed k-wires have been used to correct the fractures, as well as cannulated screws, and combinations of k-wires and screws in the talus. Rare cases used mini-plates. Patients who received internal fixation where typically immobilized in a non-weight bearing cast in neutral alignment for a period of twelve weeks . Following the period of non-weight bearing, progressive weight-bearing combined with physiotherapy is usually started. Arthroscopic treatment may be used in the management of transchondral dome fractures . Following excision of the talar dome fracture fragment, the exposed subchondral bone should be drilled with multiple small drill-holes to promote migration of fibroblasts to the surface for the production of fibrocartilage . Arthroscopically assisted internal fixation of talar body fractures using anterior portals has been noted . Open surgical approaches to the hind foot can be associated with higher complications. Some of these include surgical wound-healing problems due to the poor blood supply to the posterior ankle region. To avoid vascular damage and soft-tissue problems, fluoroscopy assisted closed reduction and percutaneous fixation has been recommended in the treatment of minimally displaced fractures in at least one source . In our case report, in order to minimize complications, we used bilateral mini-rails. The SIDEKICK® Mini Fixator from Wright Medical was utilized in our case. It is indicated to stabilize multiple fracture fragments ranging from open and/or comminuted fractures to infected non-unions, fractures with length discrepancies, fusions and corrective osteotomies of the metacarpal, metatarsal, ulnar, and calcaneal bones . This mini-rail allows early weight-bearing and decreases the risk of avascular necrosis. The patient is a 20-year-old male with no significant past medical history was brought to the emergency department following a motor vehicle accident at 75 MPH. The patient was complaining of ankle pain and swelling, along with left sided chest pain which appeared skeletal. After a complete series of x-rays and CT scans, he was found to have closed transverse fractures of the body of the talus of right foot (Figures 1, 2, and 5). He also was found to have a minimally displaced fracture of the neck of the talus of left foot that was graded type 1 on Hawkins classification (Figures 3, 4, and 5). No other fractures were seen, and no organ damage was detectable on CT imaging. His physical exam was normal, except for edema and tenderness with limited range of motion of both ankles. 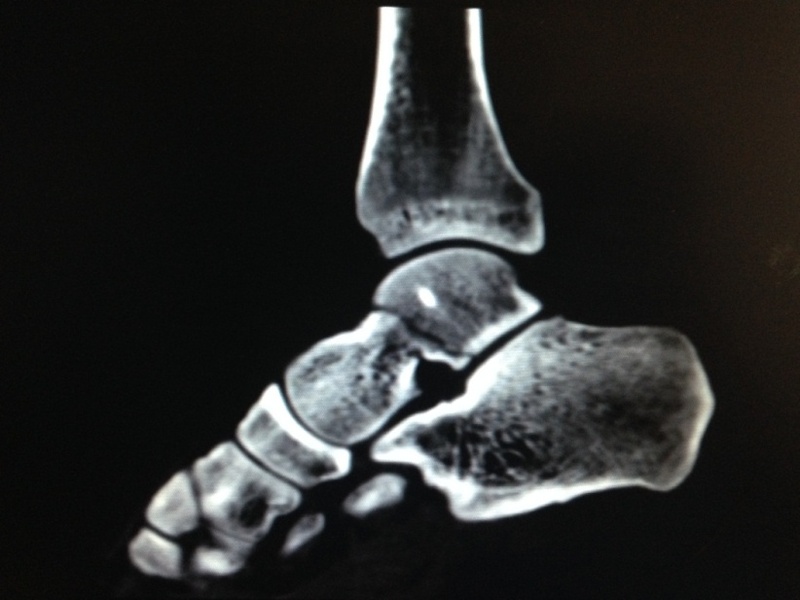 Figure 1 Coronal CT view of right rear foot showing comminuted fracture of talar body. Figure 2 Sagittal CT view of right rear foot showing fracture of the talar body. 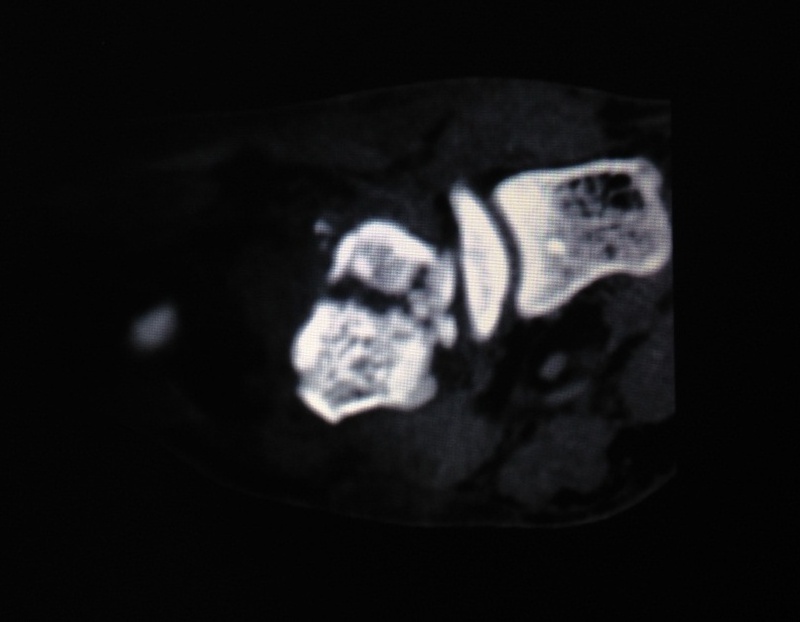 Figure 3 Coronal CT view of left rear foot showing comminuted fracture of talar neck. Initial management involved pain medication, and immobilization of bilateral ankles utilizing posterior splints with application of modified Jones compressions to control swelling. After medical clearance, surgical intervention was planned for close reduction of the talar fractures of the bilateral feet utilizing mini-rail external fixators. Figure 4 Sagittal CT view of left rear foot showing talar neck fracture. 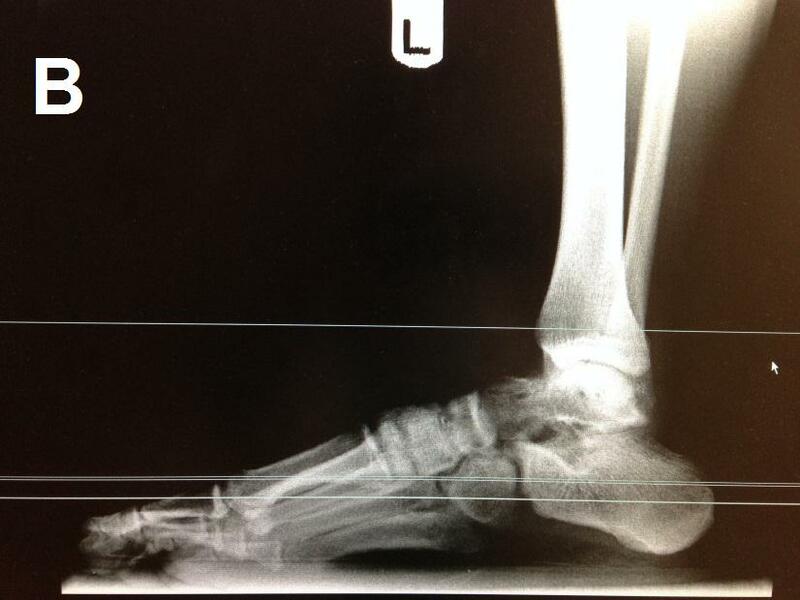 Figure 5 Transverse CT view of bilateral rear foot showing right talar body fracture and left talar neck fracture. The external fixator was applied to the dorsomedial aspect of the right foot with six half pins (two were inserted into the proximal fragment, two were inserted into the distal fragment, and for more stabilization, one pin into the navicular and one pin into the medial cuneiform bone) (Figure 6). For the left foot, the external fixator was applied to the dorsomedial aspect as well, with two half pins inserted into the proximal fragment, two inserted into the distal fragment, and two pins into the navicular bone to achieve more stabilization (Figure 6). Compression of both tali was achieved by turning the mini-rail bringing the fractured fragments together. Fluoroscopy imaging confirmed good alignment of both tali. 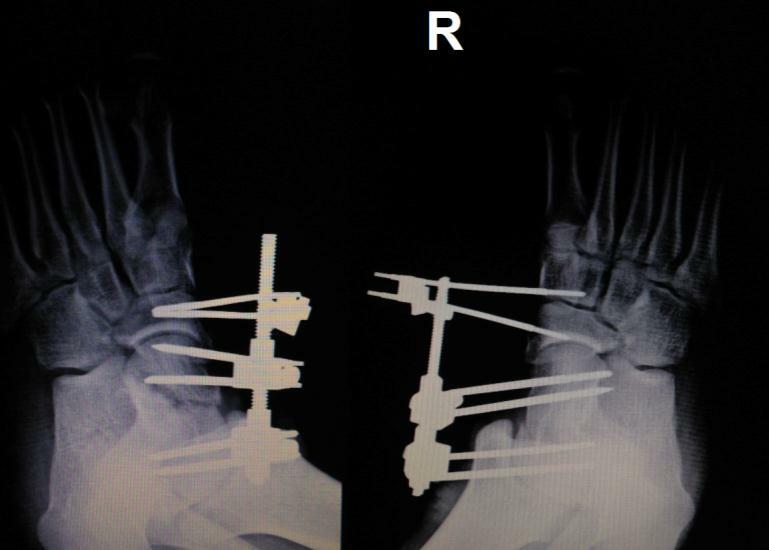 Figure 6 Post-operative X-ray of bilateral foot in AP view showing achievement of anatomical alignment of the fractured tali with the assistance of the mini-rail compression and fixation. The patient received antibiotic before and after the surgery. Postoperatively, we continued with posterior splint and modified Jones compression with non-weight bearing to bilateral foot, assisted with wheelchair. Medications for pain and DVT prophylaxis were prescribed on discharge. One week after surgery, the patient reported minimal pain to right foot. He reported walking on his feet disregarding our instructions. Seven weeks after the surgery, the patient reported no pain. 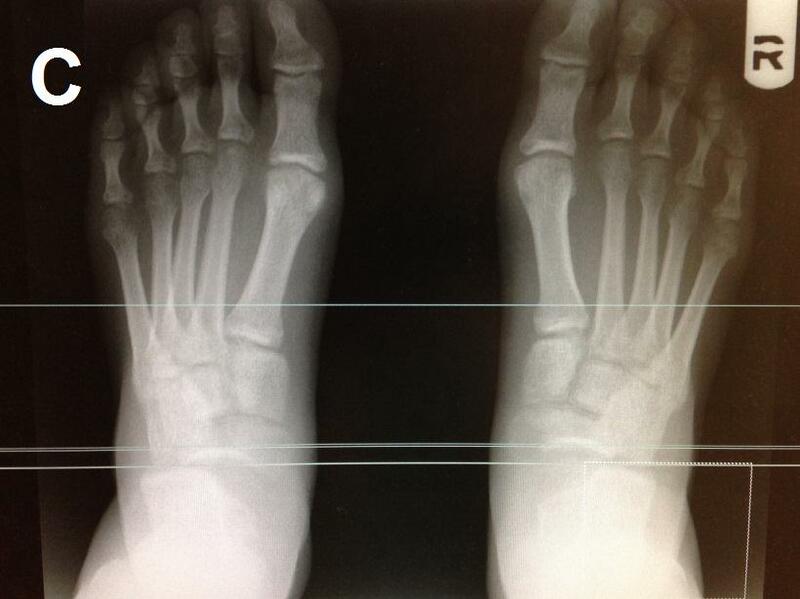 X-rays of bilateral feet revealed healing of the talar fractures. 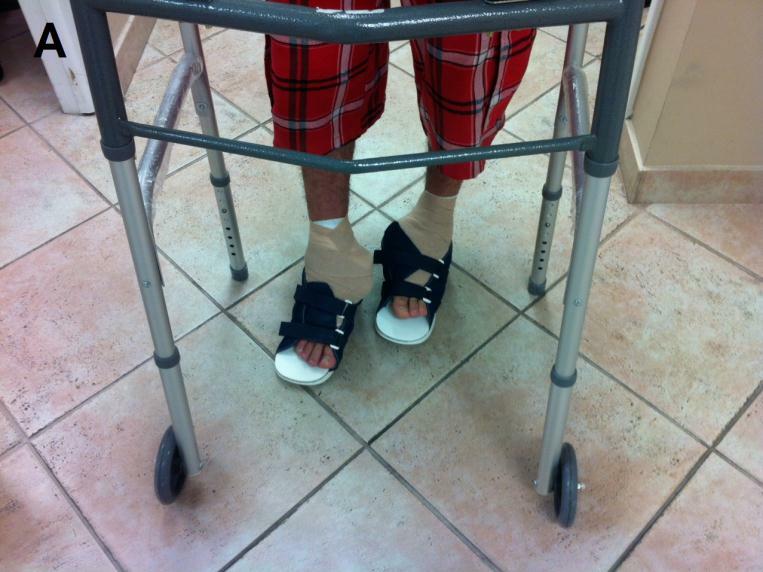 He was allowed to bear weight partially assisted with a walker and resume physical activity moderately (Figure 7). 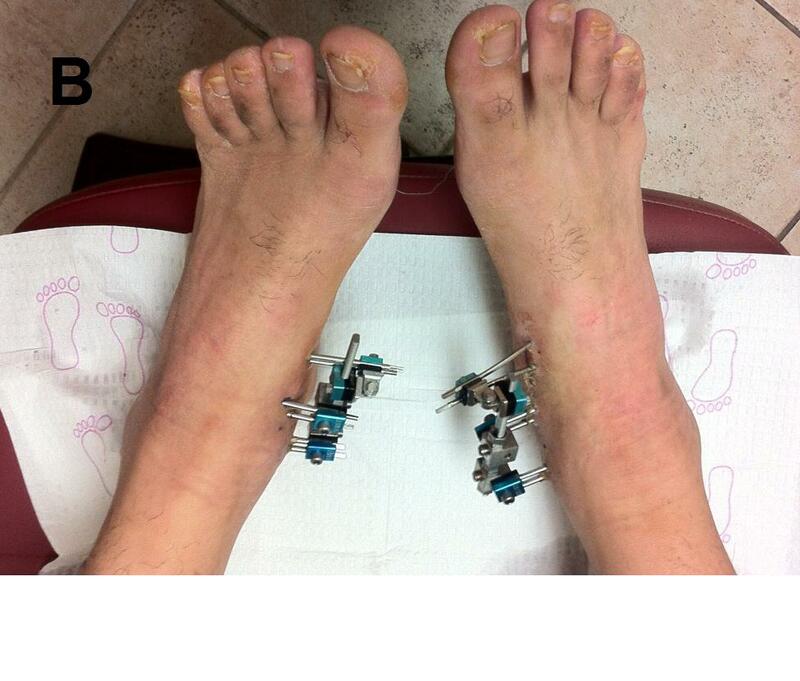 Figure 7A & B Clinical pictures of the patient 7 weeks after the surgery date with partial weight bearing and mini-rails bilateral foot. At nine weeks post operatively, the hardware was removed. Patient tolerated walking without pain and was tolerating physical therapy the week after removing the hardware. X-rays taken one month after removing the mini-rails demonstrated complete resolution of the fracture sites (Figure 8A, B, and C). Figure 8A, B, & C Bilateral Foot X-Rays in Lateral and AP views demonstrating complete resolution of bilateral talar fractures post removal of the mini-rail fixator. Because of the young age of the patient, in the hope of achieving earlier weight-bearing with a better chance to be able to return to work, we chose mini-rail as a minimally invasive approach. Conventional therapies, such as Kirschner wires, would delay early weight-bearing. Our choice of mini-rails also avoided the vascular and wound healing complications that are commonly associated with an open approach to the rear foot. This patient had a chance to heal with no complications, in a shorter time, and was able to ambulate earlier than conventional internal fixation would allow.